When the first issue of Gerry Conway’s Amazing Spider-Man: Renew Your Vows was released, it was not something I paid much attention to. I had been largely indifferent to Dan Slott’s run with the web-head, and since the series was a continuation of his 2015 Secret Wars mini-series, I was under the impression that I could expect something similar to his execution. I decided to give it a try anyway, and could not have been happier with it. Conway and Ryan Stegman’s effort on the book was not without its flaws (which seem to mostly be the results of time constraints), but I felt their 12 issues were truly phenomenal and told a heartwarming story that made me smile every single issue, and even brought me to tears at one point. So, when the news broke that the book was getting an entirely new creative team, I was at least a little concerned. Jody Houser is our new writer, someone whose previous work I am unfamiliar with. I am so beyond relieved to say that she started off on the right foot with issue 13 – this series’ take on the Marvel Legacy initiative – and seems to be a good fit. The eight year time jump was something I wasn’t sure what to make of, but it’s nice to see that the family dynamics are surprisingly normal for the Spider-Family. 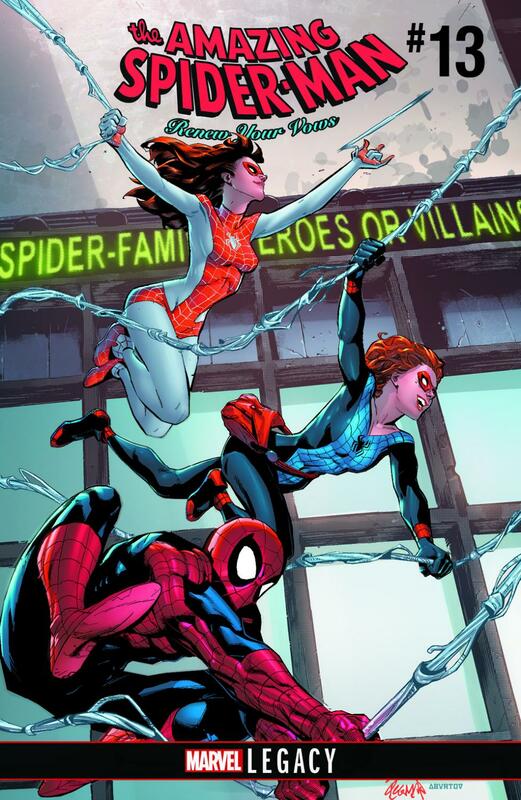 The characters all have distinct voices that fit their roles in the group well; Annie is sometimes distant but loves her parents and what they do, Peter is the father that is maybe too eager to spend time with her, and MJ is a bit more like a voice of reason that keeps him in check while somehow being a mom/superhero/business owner. Seeing how these relationships might have functioned in 616 had One More Day not occurred is just as bittersweet and satisfying now as it was when the first issue of this ongoing was released. I’m glad that we don’t have to rely on Annie being a small child for this book to work. The dialogue in general feels very natural too. “Annie, are you okay? Are you okay, Annie?” might have made me groan just a little, but I guess that was kind of the point, since that was Annie’s reaction too, and I suppose we had to get that joke out of the way sooner or later. On the other hand, her picking the Wolverine tsum-tsum prize at the fair just to show it to Logan was my personal highlight of the issue. It definitely feels like something her dad would do. The look of the book gets a new drive with this arc as well. Nick Roche has taken on the art duties with Ruth Redmond on ink. To me, the most memorable thing about Roche’s art is that his faces really say a lot about the characters themselves while being expressive. Logan looks like the tough 5’3” killing machine that he is, even without popping his claws, but his face shows that he has a soft side when talking with Annie. Meanwhile, I can’t recall seeing Peter looking this dorky in a long time, and I do mean that in a good way. These faces depict disbelief, satisfaction, anger and more in believable ways. Especially commendable is his background work. I feel like too many artists would have gotten a little lazy at some points here, but Roche makes great work of his settings. Even a simple car ride has more going on than you would expect in some panels. When the backgrounds are empty, it’s a joint effort with Redmond to convey a spotlight on the featured character. This gives the book a very cartoony feel at times, and I feel they pull it off remarkably, especially considering its use throughout the issue. Reds to a mellow orange are used to convey anger or frustration, while a bright green is used in action and movement as a contrast to the red found on each hero’s costume. It’s effective and it doesn’t get old throughout the book’s twenty-six pages.